1.5 oz bag of kettle cooked potato chips. malt vinegar & sea salt. 1.5 oz. bag of kettle cooked potato chips. 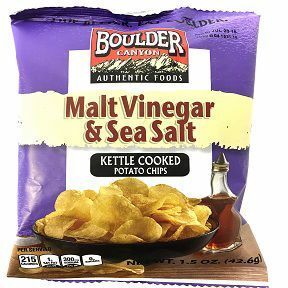 malt vinegar & sea salt. no trans fat, cholesterol, or msg. vegan. ingredients: potatoes, sunflower and/or safflower oil, malt vinegar powder (maltodextrin, food starch modified, malt vinegar), white vinegar powder) maltodextrin, distilled white vinegar), sea salt, fructose, maltodextrin, citric acid, malt extract.